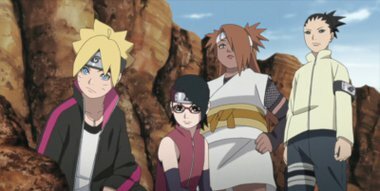 Leaving behind Inojin in the case of an emergency situation, Boruto and the rest aim towards The Village Hidden in the Stones (Iwagakure). They decide to rely on the former Tsuchikage, Ohnoki, who they met at the Five Kage meeting. As they look for where Ohnoki is, Boruto and his friends are spotted by a certain character as they are infiltrating into the village. On the other hand, after being unable to make contact with the scout team that was sent to The Village Hidden in the Stones, the leading Jonin of Team 7, Konohamaru is sent after them.